Caitlin Wineyard is this week’s guest blogger. She raises funds for Meighan Youth Theatre via easyfundraising. “I have been a member of MYT for a year and I can honestly say it has been the best year I have experienced – period! For young actors and actresses in the local Manchester area it is an amazing way to experience performing on stage at semi-professional venues and meet new friends for life. Since joining MYT I have performed twice at the Garrick Altrincham Playhouse, performing to 400 people each night when the show sells out. 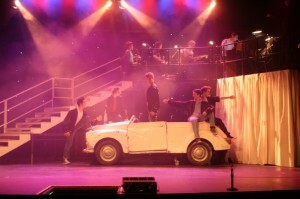 The set is also a really good experience, performing on things such as a revolving stage in ‘Thank You For The Musicals’ and using a full sized car in ‘Grease’. The costumes are always made to fit each individual actor and actress which makes the show seem for the performers and audience that much more professional. However, without funding all these extra things that makes the show so much more exciting cannot be done. Directed, musically directed and choreographed by 18 year old Joseph Meighan, the last show ‘Thank You For The Musicals’ received a 5 *rating! The next musical that MYT will perform is ‘Footloose’ and I believe I speak for the cast when I say we would love it to be as professional and exciting as it always has been.